In all of Quentin Tarantino’s films, he never likes to tell a story in a plain vanilla style. He normally likes to use a nonlinear story instead. This time around, Inglourious Basterds tells two different linear stories that start off disconnected and jump back and forth between each other, but then the two stories finally come together and dovetails nicely at the very end. Inglourious Basterds is set in Nazi occupied France during World War II. The first story shown is about a young Jewish girl, played by Diane Kruger, who barley escapes capture by the main Nazi villain, played by Christoph Waltz. The second story is about Brad Pitt‘s character who has gathered a team of Jewish Americans to be his Inglorious Basterds. A team that runs around seeking revenge on Nazis by killing and branding as many as possible, with the ultimate goal to take down Adolf Hitler. Quentin Tarantino likes to use a strong female lead, like in the films Jackie Brown and Kill Bill. Or instead of a central lead, he will have a strong all male team, like he did in Reservoir Dogs and Pulp Fiction. 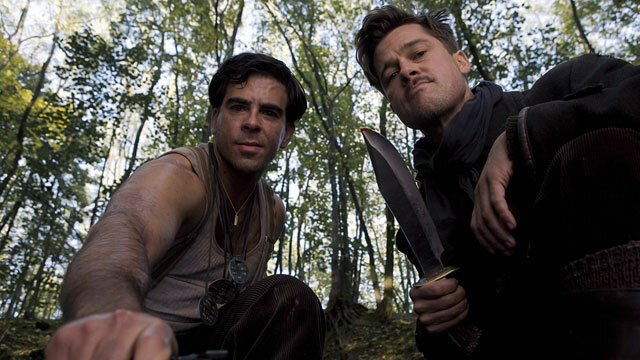 With Inglourious Basterds, he was able to have both a strong female story along with a story of a strong all male team. Quentin Tarantino also place his films in two distinct worlds. One is the real world where normal rules apply, featured in his films Reservoir Dogs and Pulp Fiction. In the other world he uses, which is set in the Hollywood movie world, most rules do not apply. Like Kill Bill, it is often bizarre and over the top. Inglourious Basterds walks a fine line between the two worlds. I feel that the story line about the Jewish girl is set in the real world, with long drawn out realistic moments. Where as the story about the Inglourious Basterds themselves, is set in the movie world, with over the top actions, comedy and even a narrated introduction of the team. Quentin Tarantino is a filmmaker who truly loves films. He shows this off in Inglourious Basterds by having a premiere of a Nazi propaganda film play a central plot. Along with playing a main character in the main film, Eli Roth directed the propaganda film within the film. Like always Quentin Tarantino has to use many long drawn out slow scenes but Inglourious Basterds uses this the best out of all of his films. All of the scenes feature either a group of Jewish people hiding from Nazis, or a group of Jewish people undercover talking with Nazis. They have to be careful because any wrong move will reveal who they actually are or where they are hiding, thus the slow drawn out scene builds tension and work perfectly for this film. All the characters in Inglourious Basterds are great and will go along well with the collection of already classic and unique characters Quentin Tarantino has created. Brat Pitt plays a guy who is too full of himself and is actually kind of dumb which leads himself into trouble. Eli Roth plays an absolutely crazy Nazi killer, which is very funny and I would like to see him act more, instead of write and direct. And Christoph Waltz plays an manipulative two faced Nazi who is always playing a game with someone. He is such a great character that he over shadows Adolf Hitler in this film. It was also great to see minor roles go to B. J. Novak from The Office and Samm Levine from Freaks And Geeks. Out of the 10 films nominated for Best Picture of 2009, I will have to say Inglourious Basterds is my second favorite film of the year and possibly my second favorite Quentin Tarantino film. I am not a big fan of guns but I will be first in line when they start selling punch guns. Inglourious Basterds is a comedy and drama, set both in the real world and the Hollywood movie world, and features both a strong female storyline and a strong all male team storyline; Quentin Tarantino for the first time gets to have the best of both worlds.